Sophia Donnelly, daughter of Club member John Donnelly, vice chairman of the NPC Board of Governors, is the winner of the NPC Snow Day Snowman Contest. 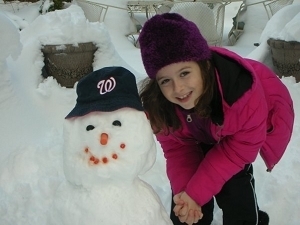 Sophia's well-designed snowman incorporated all the traditions of a typical Frosty but also demonstrated her devotion to the sports teams of the Nation's Capital, despite their mediocre records. Thanks to all who sent snowman photos.